The name is intriguing, the labels are cool, the Pinots please the palate, and the tagline, “Two Guys, a Pool Table, Some Barrels and Love for Pinot Noir” was inviting, so I decided to investigate further. Principal owner and co-founder Eric Hall spent twenty years in the pre dot-com and dot-com world working in the San Francisco Bay area for Apple, Oracle, KPMG and others. Flush with Nasdaq gains after his last dot-com employer went public in 1999, he attempted to retire in Cazadero on the Sonoma Coast where he bought a former B&B. After the stock market went south in 2001, he sold the B&B and bought a small resort hotel in Guerneville in the Russian River Valley. 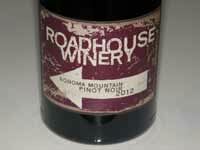 He eventually teamed with his friends and family to create Roadhouse Winery in 2010, located in downtown Healdsburg. 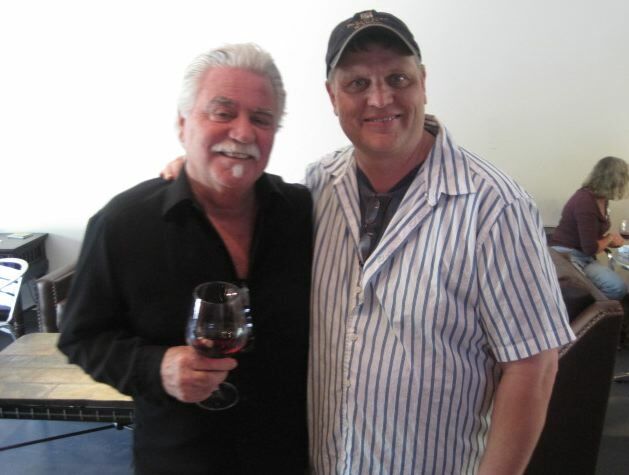 Eric spent a year working at Papapietro-Perry Winery in Healdsburg (Eric on the right with Bruce Perry is pictured below) and in late 2006, became a partner in an ill-fated venture formerly known as Russian River Vineyards in Forestville. 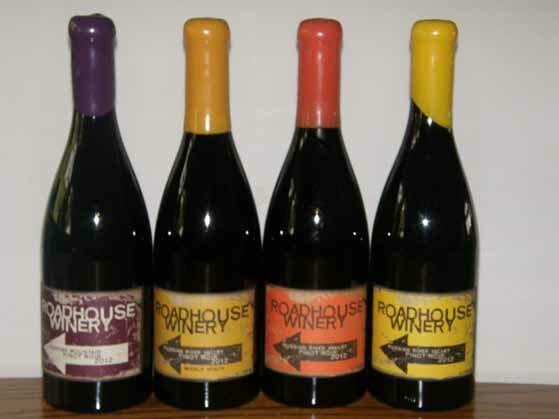 He extricated himself from that business after a year or so, landing on his feet with the founding of Roadhouse Winery. 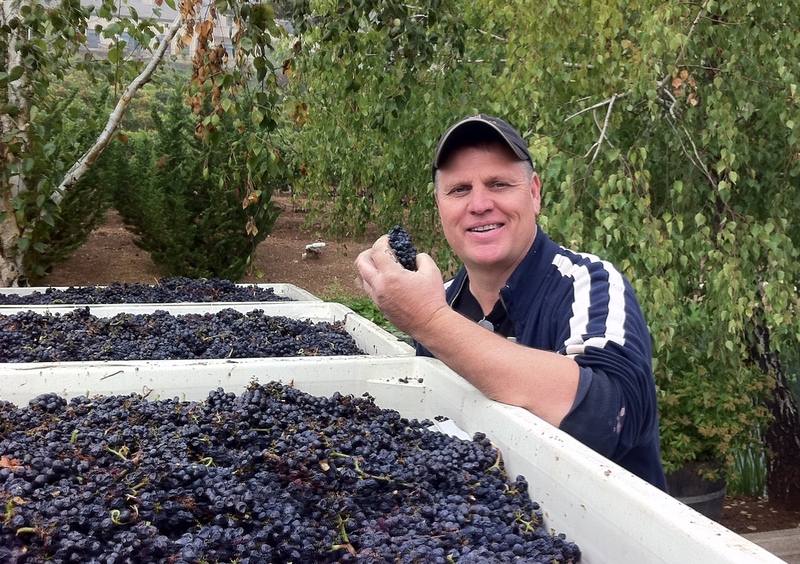 Roadhouse winemaker Eric Hall produces just over 2,000 cases of Pinot Noir from Russian River Valley, Sonoma Coast and Yorkville Highlands grape sources, including notable vineyards like Weir, Nunes, Sangiacomo, Leras and Silver Pines. The tagline mentioned in the title of this article comes from the original start up when the first item they bought for the winery was a pool table which they still have. They also have essentially a full-on disco installed in their barrel room which thumps during their events. As a holdover from Eric’s tech days, he practices slot ranking but applies it to vineyards, rotating out the lower ranking 20% to 30% of vineyard sources each year, and trying new ones in the same areas, hoping to find ones that will perform better. This is why the color-coded labels do not mention the vineyard sources. Once a certain level of quality is displayed by a vineyard, and ongoing agreements on farming practices are secured, some of the wines and their colored labels will be vineyard-designated. The vineyard sources are top notch as you can see by the wines reviewed below which are the first releases from the 2012 vintage. Upcoming 2012 releases include Pinot Noir from Sangiacoma Roberts Road, Weir, and Tina Marie vineyards. The four wines reviewed here are all well-crafted, and along with their diversity of clonal mixes, they all show individuality. The winery’s website is www.roadhousewinery.com, and the Facebook page is www.facebook.com/ RoadHouseWinery.